During 1903-4, Hermann Burchardt—a financially independent traveler from Berlin—voyaged by dhow around the Middle East with the goal of photographing cities rarely visited by other itinerant photographers. In the Omani port cities of Muscat and Matrah, he found his camera welcomed in public spaces. As he walked through the city making pictures, he sparked the curiosity of local observers. Burchardt made photographs free of the conspicuous staging and voyeurism so often seen in European and touristic photography of the time. 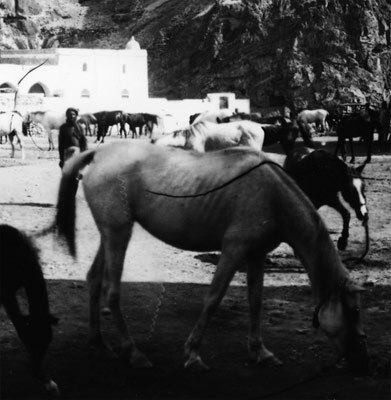 His early photographs of Oman are an evocative revelation of its diverse population, which came from throughout the Indian Ocean. He provides glimpses of the commercial hearts of the cities he visited, as well as the defensive terrain protecting Muscat in particular, which was a strategic oasis on the maritime silk and spice routes. Burchardt spoke Persian, Turkish, Arabic, and Swahili, and his images emerge from his interactions with people from different social strata and origins. 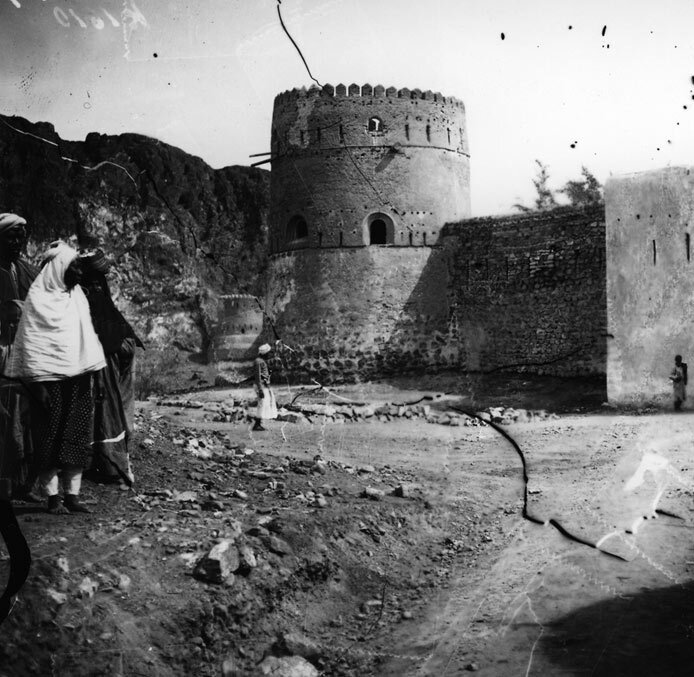 There are few other photographers who rendered early 20th century Oman with such subtlety and complexity. 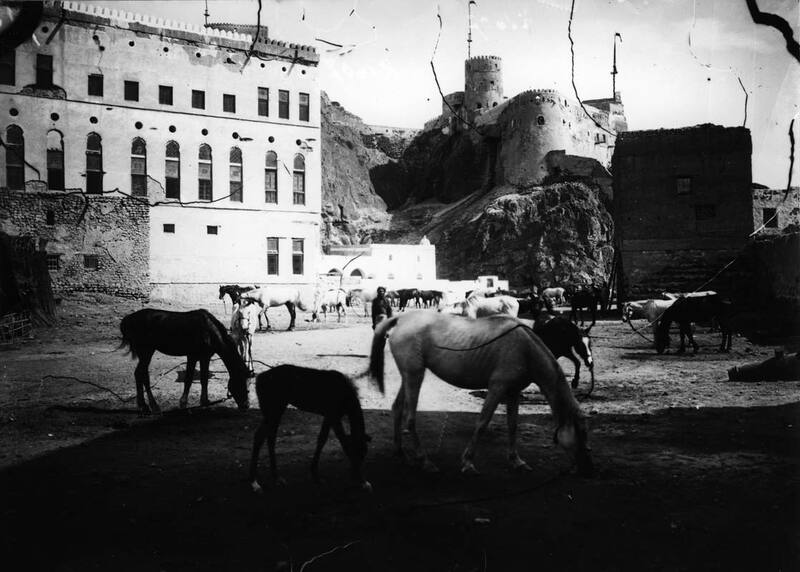 Burchardt’s photographs in Muscat were remarkable amidst the growing tide of touristic photography in the region. 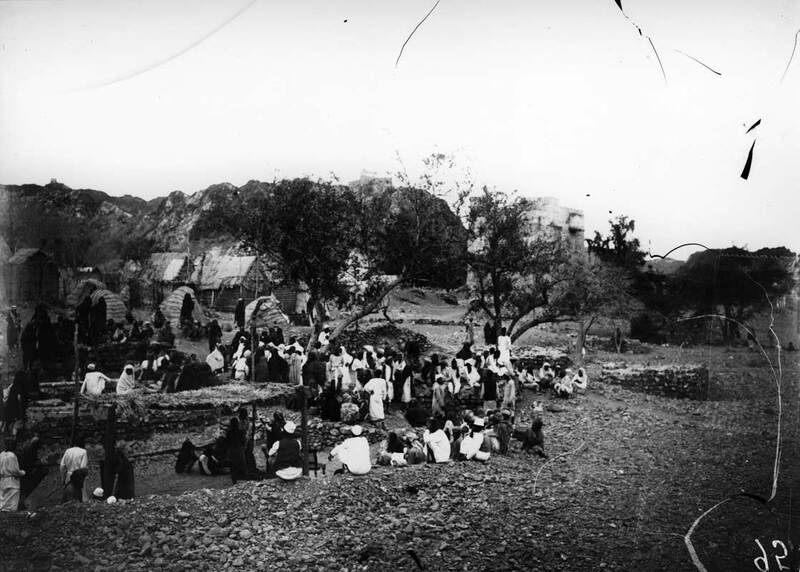 Unlike the monumental imagery of Egypt, Syria and Palestine published in abundance in the 1850s, Burchardt’s unstaged photographs included local people at ease. Here, young women from east Africa, with their heads uncovered, are curious bystanders observing the photographic process. As Burchardt travelled through Libya, Basra, Kuwait, Bahrain, Qatar, Abu Dhabi, Hormuz, and Oman (1904), his ability to photograph in public and private places was determined by the laws of hospitality, and followed the proscriptions of his hosts. He found Oman a particularly welcoming environment. Since the 2nd century, Muscat has been an important oasis along the maritime trade routes connecting Asia, Africa and Europe. 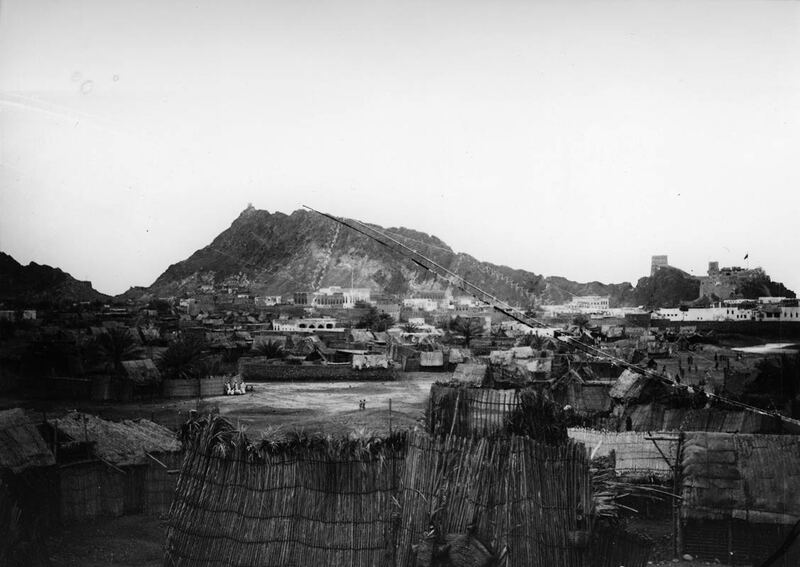 Long cosmopolitan, Muscat’s distinct settlements of Omanis, Beluchis, Persians, Bahrainis, and people from east Africa expanded beginning in the 16th century. This view, looking to the north, shows Fort Marani and its watchtowers and fortifications. Buchardt’s photographs capture how the city’s wealth and plentiful water supply shaped the defensive layout of the city facing the sea. 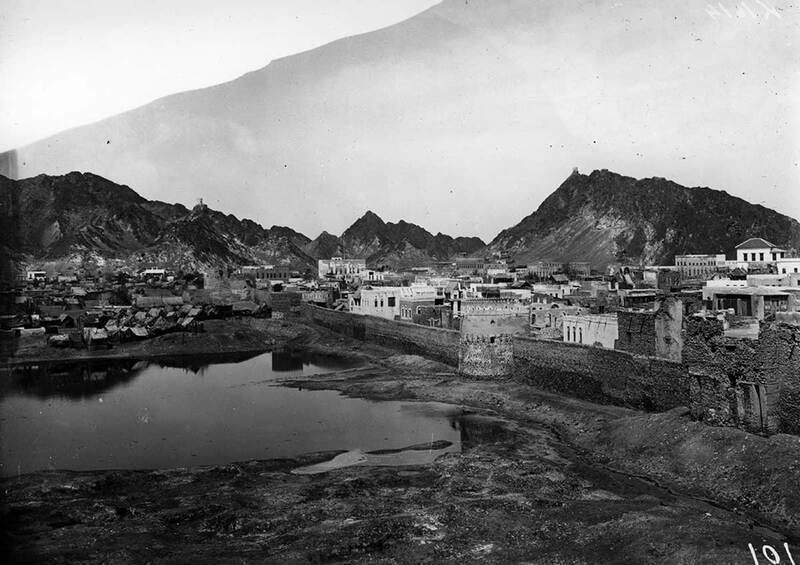 This view shows a portion of the city wall and reveals the density of two- and three-story houses in Muscat’s wealthy center. With thick exterior walls a few feet thick, many of these houses were built between 1800-1850 with timber imported from east Africa and India, reflecting the lucrative trade that built Oman’s old cities. 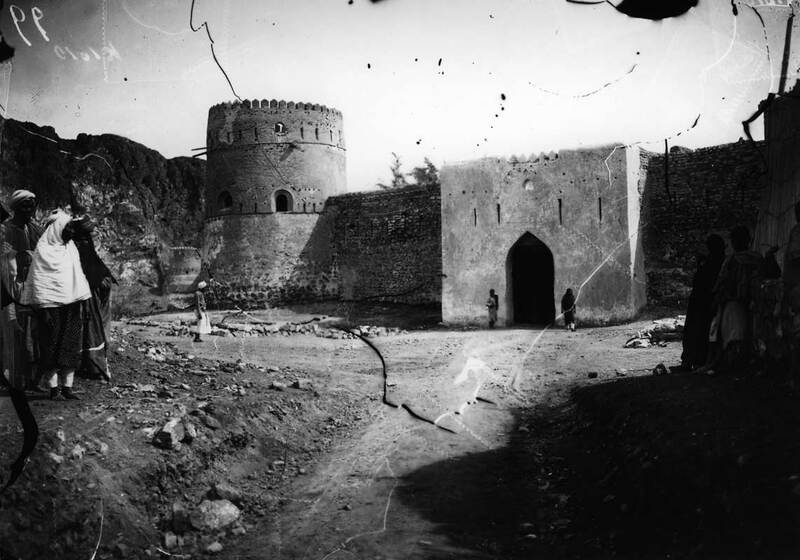 At the time Burchardt took these pictures, about 5,000 people lived within Muscat’s city walls, and another 5,000 resided in the surrounding suburbs. 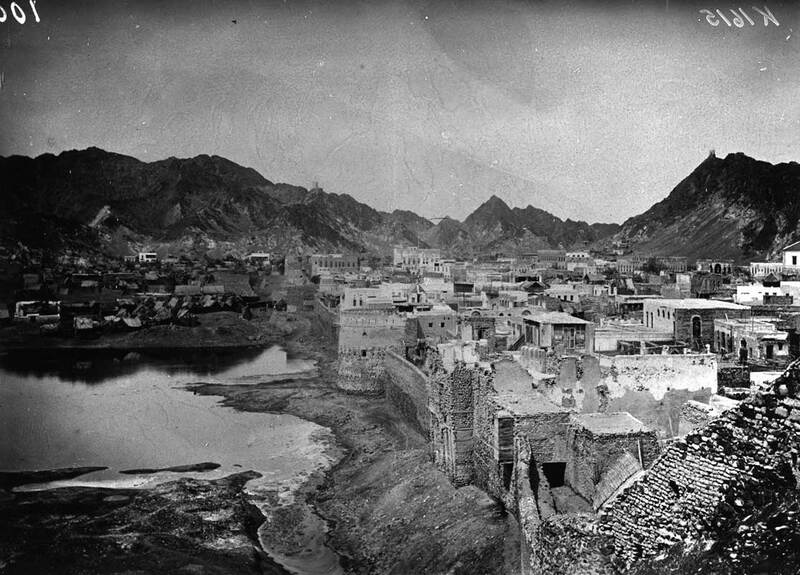 The photographer’s choice to depict the city’s social and economic topography stands in contrast to the touristic depictions of the day, which attended to the monumental architecture and avoided imagery of contemporary Omani people. 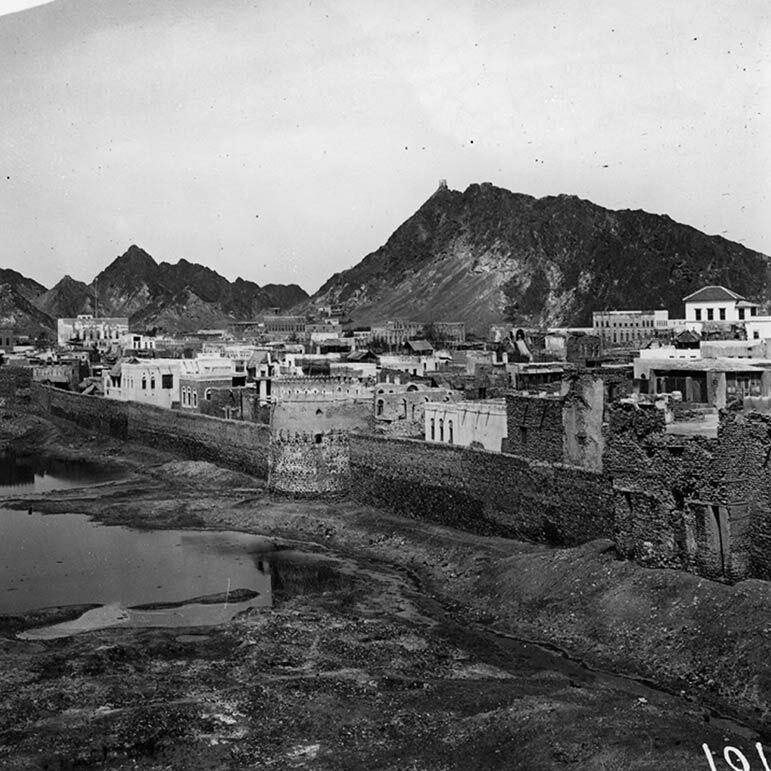 The city of Matrah was larger than Muscat, and by 1900, it had become the commercial center of Oman with 14,000 residents. 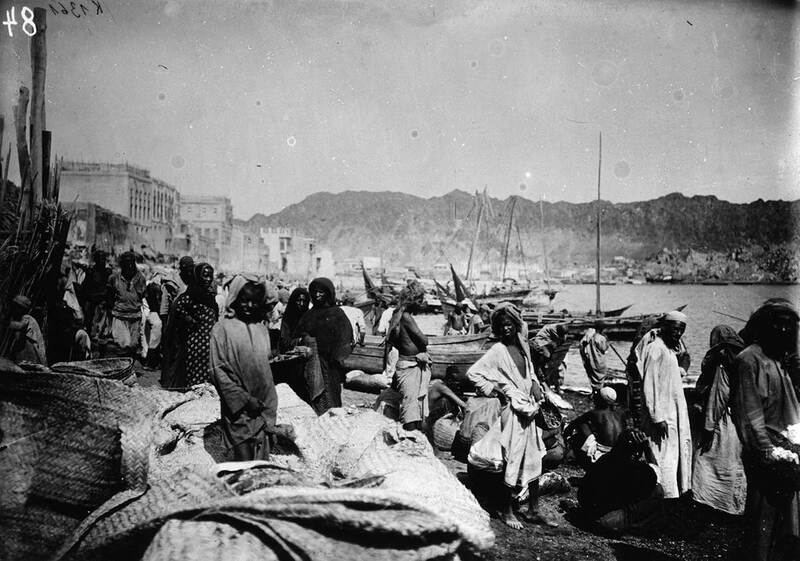 The harbor of Matrah was an important trading center where a polyglot citizenry spoke Arabic, Persian, Swahili, and Hindi. Here Burchardt focused on the mix of people working at the waterside—scenes which are astonishingly similar to waterfront scenes of Zanzibar of the same time. The houses of wealthy merchants are visible. Beyond are mountains where grapes, apples and fruits grew in abundance during the cooler seasons. The palace of the Sultan of Oman and Zanzibar, seen here on the left, was relatively quiet for much of the 19th century. After Sultan Sayyid Said transferred his residence to Zanzibar in 1833, he only rarely visited his Muscat palace. Ascending the mountain is Fort Marani, built by the Portuguese in 1527 in the short interval before Omani rulers took control over Muscat’s silk and spice routes. The low white building with a small domed tower in the center is a mosque, which typifies the minimalism and simplicity seen in Omani mosque architecture of the era. Burchardt’s composition reveals Muscat’s centuries-old divide—the walled city is filled with grand houses, while the exterior neighborhoods show more modest construction surrounded by gardens and small farms. The town walls met with cliffs and were fortified with towers, both of which protected the city from the interior mountain passes. The marsh in the foreground is a remnant of a moat that once surrounded the city’s 16th century walls. 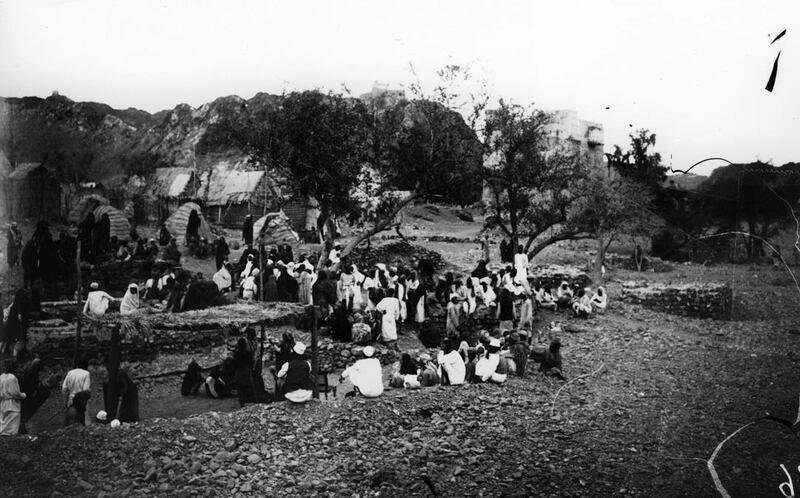 This remarkable photograph offers a rare glimpse of a community gathering just outside of Muscat, where men and women are gathering for an event, the details of which are unfortunately lost. The Hillat Hilalu quarter was home to about 50 residences, seen in the background. Beyond is the Burg Rawiya, the prominent watertower for the city’s aqueduct system.